ELDERS: The Brohier Memorial Home for elders is an arm of the Dutch Reformed Church in Sri Lanka, and was very carefully planned and executed by a committee of Management in the year 1977. Not having the necessary funds to make this a reality the church looked for foreign donors to whom Mrs. Persis Ferdinands of Australia became a willing donor and gave generously, financially and in other ways to make this venture a reality. The building was constructed on a piece of land behind the then Gas Company belonging to the Dutch Reformed Church through the Gauder Trust, in the year 1977. The building was completed and dedicated to the Glory of God by the Donor Mrs. Persis Ferdinands in the month of September 1977. The plaque for the extension namely "Mrs. Eric Brohier Memorial Home" was unveiled on October 24, 1992, in which year the Dutch Reformed Church in Sri Lanka (Ceylon) celebrated its 350th Anniversary with the wording "To God Be the Glory". It has been almost two years since I became an inmate of the Elders' home and my memories flash back to my school days at Richmond College, Galle, where I was boarded by my parents in the College hostel. My experience in the first night at the Brohier home was that the bell controls all activities of our life, which gave me memories of my College life in the hostel as there too the bell controlled our every movement and activity. * No liquor is permitted to be brought in for any purpose or consumed within the premises. * Inmates who are not invalids could walk about freely in the Wellawatte area, but should make an entry in the going out book to this effect in case one decides to visit areas beyond Wellawatte. * Visitors could be entertained between 8.30 a.m. to 12 Noon and from 3.30 p.m.
* A doctor visits the home weekly and checks on the health of the inmates. In case of an emergency the inmate is rushed to the General Hospital or the Colombo South hospital. * Medical attention and laundry costs have to be borne by the inmates. The meal menu chart is indicated on the Notice Board. Occasionally we get a special Lunch or a Dinner donated by a well-wisher in memory of a departed loved one. A matron, and three assistants, manage the running of the Home. In all there are twelve rooms. Seven rooms in the new block and five in the old block. Any complaints about food are to be made in writing to the matron and not communicated to the servants. During my childhood days I never in my wildest dream thought that I would have to end my last days as an inmate in an Elders' home for men. 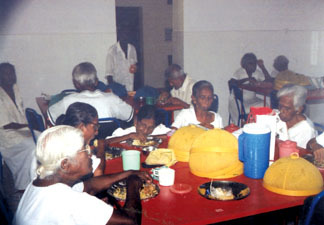 In the years gone by Elders' home were never thought of as most of the Elders were taken care of by their children who were mostly employed in Sri Lanka. However as time passed the whole concept of family life changed as many of the children (sons and daughters) found foreign jobs and also migrated to different countries thereby leaving their parents to fend for themselves. It is during this period that many in Sri Lanka, like in many other countries, also started looking in the direction of establishing Elders' homes. As a result many of the children tenanted their parents in an Elders' home for men or women, and to discharge their responsibility remitted Foreign Funds for their upkeep direct to the Elders' homes. In some instances the children were so busy that they even didn't have the time to visit their parents at the Elders' home, who are left entirely at the mercy and in the hands of the staff at the Elders' homes for their existence. I suppose that we elders have to learn to adjust to the changing situations around us and try to live our lives as best we could without the help of our children. Of course if they feel that they should help when help is necessary, we should leave it entirely to them to contemplate as to what hardships parents of the earlier generation went through to bring their children up in order to make them what they are today. There are some parents who collected money by forgoing their meals just to be able to pay for their children's education. There are some parents, who hadn't the wherewithal to spend for their children's higher education, and as a result when such children grew up and obtained employment they on their own spent their earnings and qualified in some specific field. These types of children often refer to this and say that they have arrived at this position in their life through their own sweat and hard work and their parent didn't provide for their higher education. What they fail to realise is that, to be able to fend for themselves, it is their parents who made the initial sacrifices to give them a good education in order to make them what they are today. Due to these various conflicting ideas and thinking some children have treated their parents with scant respect, and as a result they think of them with certain amount of bitterness and as such leave them at Elders' home to whither away their lives until they are called home by their maker. Some take this easy way out because they don't have the time to devout to their ageing parents. We are of the older generation and we feel that this is not the way children should treat their parents. As human beings, whoever or whatever we are with all our faults and failings, they should learn to respect us for what we are, and for all that we have done to bring them up and make them men and women in this world. They should also learn that some day they too would be in the same situation when they come to old age and in turn they will expect their children to do for them, which we as parent would have expected them to do for us. If the children discharge their duties towards their parents in old age, then there will not be any need for Elders' homes in the present or in the future. These are my reflections of life in an Elders' home during the past two years.